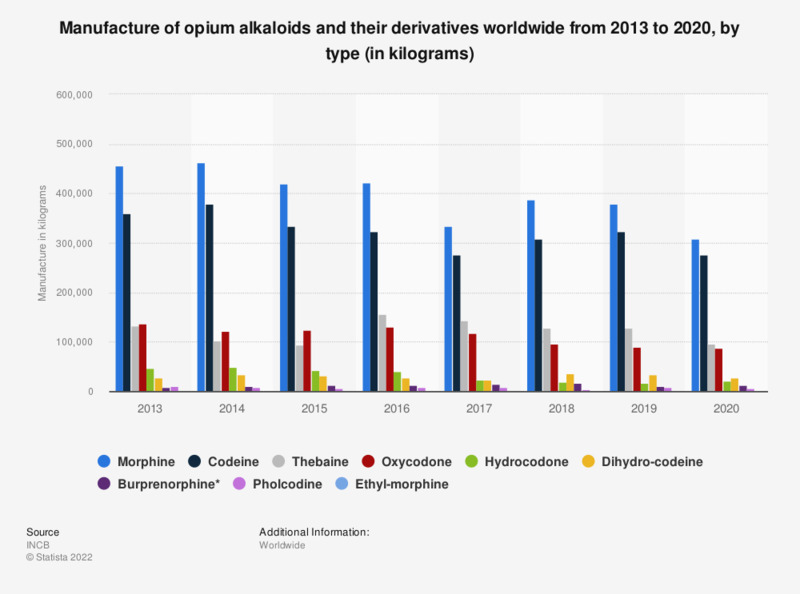 This statistic displays the manufacture of opium alkaloids and their derivatives globally from 2010 to 2016, by type. In 2010, there were 409,267 kilograms of morphine manufactured worldwide. Global consumption of this drug has grown by almost a factor of six between 1991 and 2010. Differences around the world in consumption levels of morphine for pain treatment are due to economic, knowledge, and regulatory factors. * A type of opioid controlled under the Convention on Psychotropic Substances of 1971. Everything On "Global drug use" in One Document: Edited and Divided into Handy Chapters. Including Detailed References.